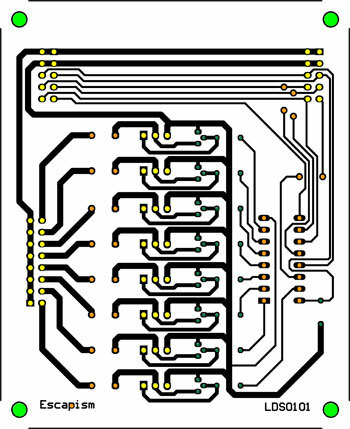 C-Boards is a production outfit geared for the manufacture of same day prototype printed circuit boards (PCB's) for electronics designers and product developers in South Africa. Operating out of Waverley, Pretoria, since 2003, our capabilities have grown to include, etched aluminium plates, general etching and machining of small parts. We are dedicated to simplicity. To this end we have developed our own software to generate the necessary machining data from pdf documents. All we need for a single sided board is a pdf file with an outline and the holes visible as white spots of the correct size. The picture on the right has been coloured by our Hole-Finding software as it determines the drill file.